Spintronics-Info is a news hub and knowledge center born out of keen interest in spintronic technologies. Spintronics is the new science of computers and memory chips that are based on electron spin rather than (or in addition to) the charge (used in electronics). Spintronics is an exciting field that holds promise to build faster and more efficient computers and other devices. Researchers from Shinshu University, the Chinese University of Hong Kong, the University of Tokyo, Tsinghua University, Kyoto University and Nanyang Technological University have experimentally demonstrated a breakthrough in manipulation of skyrmions using only electric field. The team, led by Professor Xiaoxi Liu of Shinshu University, designed and fabricated magnetic multilayer films in the form of racetracks where the thickness of the films had a slope. They demonstrated that many skyrmion bubbles can be created and directionally displaced about 10 micrometres by applying a voltage as low as 9 volt in a repeatable manner. They also found that the domain wall displacement and velocity induced by the variation of electric field are proportional to the absolute value of voltage. Researchers from the University of Tokyo developed a method to partially switch between specific magnetic states at Thz frequencies. 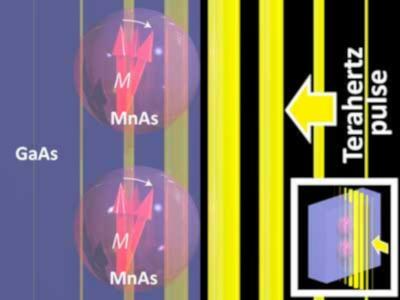 The researchers used short high-frequency pulses of terahertz radiation to flip the electron spins in ferromagnetic manganese arsenide (MnAs). Such techniques have been attempted before, but the magnitude change in the magnetization of the MnAs was too small - but in this current research a 20% change was achieved. Such a technique could be used in the future to create Thz spintronics devices - one that operate at a much faster rate compared to today's Ghz electronics devices. Researchers NTU, NUS, A*STAR and the Los Alamos National Lab have demonstrated that it is possible to inject an ultra-short pulse of spin current (less than a picosecond) from a metal to a semiconductor in a very efficient way. The researchers used a short laser pulse on cobalt (a magnetic material) - which generated a spin-polarized "swarm" of excited electrons. 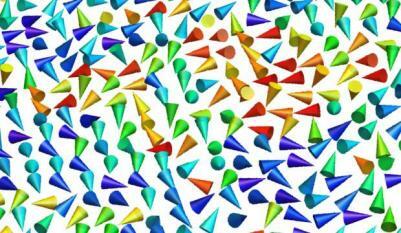 The spin-polarized electrons travel outside of the material - into adjacent materials. This creates an extremely efficient spin injection.